Finally, after two years of dogging sweat in book writing, I am free to return to Alaska. I'm dragging my illustrator up with me, and the two of us are heading to Kodiak this coming Saturday. We are Florida boys, so the trip is long and arduous. However, here's how we play it to make it fun and worth our time. PACKING: No issues here. We get to check two bags at 50 lbs. each and that's it. Each of our carry-ons consists of a rolling suitcase that fits in the overheard bin and a handful of rods broken down and bundled. Interesting to note is that the two checked suitcases are a rolling duffle bag and and a rolling cargo bag. Clothes go into the duffle, and cooler, waders, and tackle bag fit into the cargo. There is a mini Styrafoam box inside the cooler that is filled with frozen meats, cheeses, and butter to defray the expensive cost of buying them locally. The cargo bag is new, I found it with a keyword search of "rolling cargo bags" on the Internet and it was reasonable and shipped free. THE NIGHT BEFORE: Why sweat making a dash to the airport in the early a.m.? Instead, we will bring the girls and rack in a nearby airport hotel and make a night of it. If you have a spouse or a girlfriend, and are leaving them for a week so that you get to chase fish, then pampering them is a smart call. Dinner, dancing, and you-fill-in-the-rest is one heck of a send-off. ANCHORAGE ARRIVAL: We won't make it in until mid-evening, and that's too close for the last flight to Kodiak. Instead, a complimentary limo will pick us up and we'll stay at the Best Western on Spenard. A tunnel goes right under the street and we can walk over and take in dinner at The New Millenium in style. KODIAK DEPARTURE: That's the next morning, and we are outbound at 9:30 a.m. We won't even have to touch our rollling duffle to change our clothes, because that change is packed in the rolling suitcase. All we have to do is ask the front desk for a complimentary tube of toothpaste becuse the airlines no longer permit you to bring it on board. We stored the frozen goods in the hotel's cooler the moment we arrived. We'll pull them out the next morning before we leave. ISLAND ADVENTURE: Six and one half days of chasing silvers and chasing friends. Sure, we'll get wet. It's September on Kodiak and weather is always a crap-shoot. But we will love it, every soaking shower, all the rotting pinks, and every bear aware minute of it. COSTS: The round trip from Florida to Anchorage was free with air miles garnished via credit card usage. The hotels in Tampa and Anchorage are discounted 30% due to AAA rates. The car rental on Kodiak was cut in two due to cooperate discount. We are staying in the twin room of Beaver Creek Lodge at $50 per guy, per night. Silvers are stacked up in the Russian River right outside the back door. The place is booked with a contingent of cops from the Lower 48, and I already can hear all of us telling whopper's in Ron Eller's Sportsman's Bar. Last edited by Bernard R. Rosenberg; 09-13-2006 at 04:53. Sounds like you have your trip all planned out very well. Right down to the beef jerky! Once you buy a pound of it in the grocery store, it will set you back $12.00. We picked up 4 lbs. of it via the Intenet and saved $15.00 overall. Where are you guys staying, and what rivers are you planning to fish? 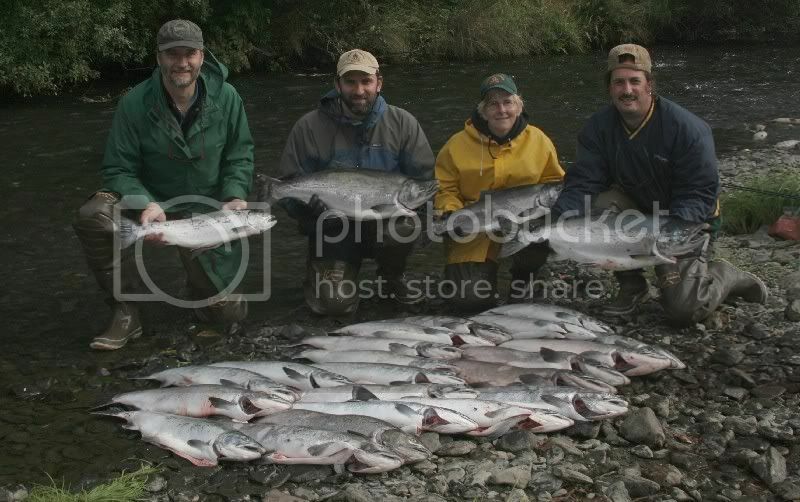 A friend of mine just got back from Kodiak Lodge in Larsen bay and limited out on huge silvers in the bay and river. Larsen Bay is in Kodiak's Remote Zone. (fly into the town of Kodiak, then hop a bush plane or boat to the village) Little wonder your friend did so well, that loaction is one of the most spectacular and productive on the island. I'll be in the town of Kodiak taking advantage of the Road System. Among the notables that I'll probe will be the American, Olds, Pasagshak, Russian, Chiniak, Buskin, and Monaska drainages. As well, there are several beach spots that have been planted with silvers by ADF&G for direct shore casting. I was there two years ago and silvers were thick all over. Weir sonar counts on the Buskin have already indicated a superior return, and ADF&G has already increased harvest quotas on that river. I'll be staying at Beaver Creek Lodge. It's a superior roadside B&B with full amenities in a private setting right on the Russian River. Fall showers that flood the bays bring the silvers into all the tributaries, and they are relatively short. The end result are silver bright catches all over the place. Best news? No crowds. Though this is Kodiak's most popular roadside event, elbow to elbow combat fishing is hardly the norm. Tour busses are non-existent, and about the only thing that interferes with quality fishing is simply your not being there. This might seem like old hat to the local, but for the out-of-towner like me, it's a much anticipated event. Right now there is a camper van full of Germans who are just about ready to depart mainland AK for the ferry to the island. They call themsleves Beck's Team due to thier love of the beer from their own hometown of Bremmen. Their van will sport a German flag and a custom plate with the team name. "MOCK SCHNELL; COM EN ZEE HERE MIT BIER UNT FEISH!" The small fish being held by the guy in the green jacket, what is it? Looks kind of small compared to the rest of the silvers you got?